When one thinks of Mexico generally, at least locally, one thinks of a popular travel destination like Cancún, or the stunning beaches of Puerto Vallarta and Acapulco. However, besides being a tourist haven, Mexico is steeped in so much controversy here in the U.S. We seem to be a nation divided in how we react or appreciate the upcoming twenty-year anniversary of the implementation of NAFTA (North American Free Trade Agreement). Essentially, NAFTA created a tariff removal of the economic barriers that previously blocked the free trade of goods between the United States, Mexico and Canada. The discussion surrounding NAFTA seems somewhat of a daily occurrence in my household. We are constantly surrounded by labeling on produce in our supermarkets that is as noticeable as can be: avocados from Mexico, succulent red and yellow bell peppers also grown in Mexico, or hummus dip made in Canada. None of these wonderful delicacies were available to shoppers in the east coast region of the US where I live prior to NAFTA; if it was purchased here, it came only from USA or European suppliers. It has not just affected our food diet, however. The share of artwork, for example, between historic museums in Mexico City and more modern ones located in Los Angeles, California is now easier; art or natural history exhibits are able to more readily travel between Mexico and the United States. The cultural exchange has been ultimately for the better between both nations. Continuing with this Widget series body of work, I look at how information received as news headlines from online sources can introduce others to the positive aspects of two adjoining nations interacting (using Mexico and the USA as the model) politically, culturally and economically through joint pursuits. 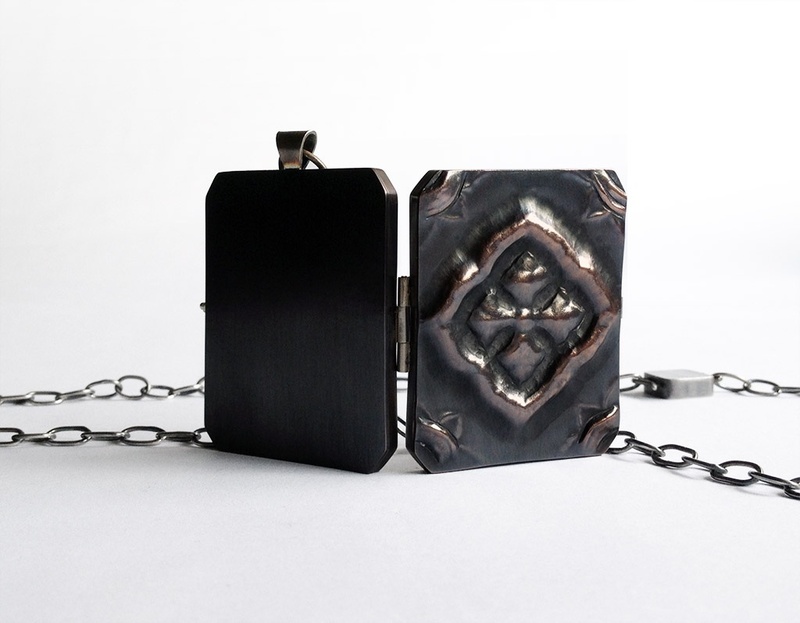 Just as my previous jewelry piece discussed on artdoesmatter uses patterning from the Art Nouveau period, this locket’s chased patterning is derived from the history of the decorative arts of Mexico, such as the elaborate patterns found in ceramic or copper/tin tiles. I use chasing and repoussé on metal (a technique common in the history of Mexico’s metalworking genre) to create a beautiful exterior on the locket. 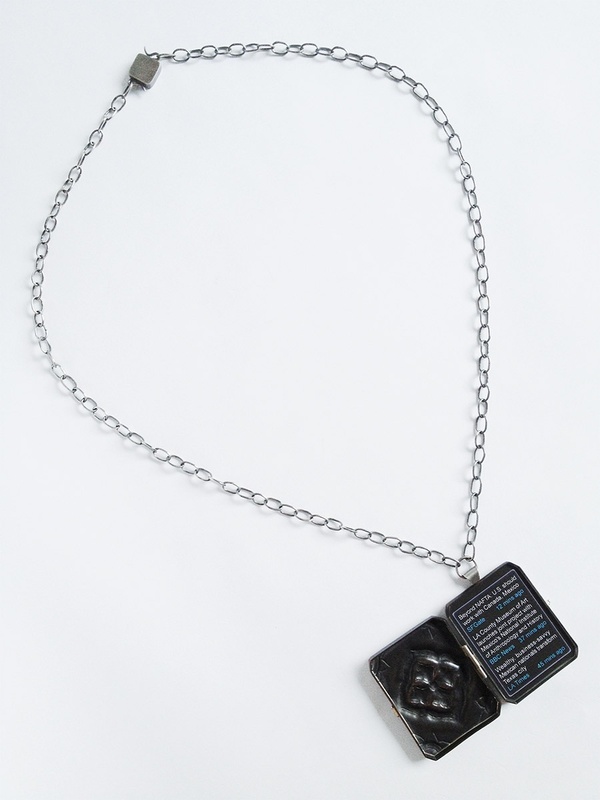 Once the locket is opened, it reveals text that is printed on archival paper designed and typeset in Adobe Illustrator. The paper is cut and pressure-fit tightly into the locket’s rear octagonal piece and set behind polished Plexiglas hand-sawed to fit the exact shape of the locket. The entire locket body, hand-fabricated sterling silver oval chain and hollow-constructed silver clasp are oxidized to give this piece a darker, more “age-old” overall look. My Widget Locket #4: Homage to Mexico is more of a celebratory one-of-a-kind jewelry piece and does not seek to take sides with the NAFTA debate. I wish to merely point out how the two nations have grown to work together for a positive outcome. Exactly. For lack of a better phrase – it is the MTV generation that I was raised on – when it was short snippets or seconds max to glean whatever info you can from news or trends. Yes, it can add also to much misunderstanding….thank you so much, Dawn – I genuinely appreciate your VERY compelling commentary on my piece! thanks Patricia… I do find these pieces thought provoking 🙂 which is what art is all about! Patti, your wonderful piece certainly combines old tradition and new. It lures you in with a vintage patterned locket (pre-NAFTA) and then a very decidedly modern spin with its snippet of on-line news sources on the subject matter. You would half expect to see an iconic version of the virgin mother, found in more traditional pieces. Deb, that is precisely my motivation in making this jewelry piece. You really nailed it. When I started investigating the history of objects relative to traditional Mexican art, the pieces of religious artifacts just as you mention here are what types of things I am trying to bring outward and “more modern” to a current-day wearer. Thanks so very much for stopping in and sharing such fabulous comments! If it is true that at some level, even if trivial, all our actions have a political dimension, then that must apply to our crafted artwork, even before it incorporates overt political content. I am all in favour of using art as a medium for a message, and it is not even necessary to be seen to take sides – the value can be just in provoking debate. Thus I was working on a piece for submission in competition where the finished bowl would have had the post-codes (ie zip codes) of all the proposed fracking sites in the UK scripted on the inside – nothing else. Unfortunately the bowl fractured in the kiln and the deadline was missed. Such is fate! All of which is a way of saying what a beautiful piece of metalwork that is! Pete, you’ve grasped exactly what content-wise I’m doing: seeking value in provoking debate, not choosing pathways or sides. Also, I’m so happy you shared the past challenge of an important piece cracking after firing. In my senior year of school, I made this bowl in a beginning clay class that was to be raku-fired. I was so excited; then you should’ve seen my face when the piece fractured right through the edge while it was being fired. I still have it, can’t bear to discard it. I can understand that feeling you experienced so clearly!! I cannot thank you enough, Pete, for your kind remarks and your candid comments today, so wonderful! It is fascinating and beautiful Patricia. I love the way it allows viewers to see and ponder according to their own views. It also gently encourages the apolitical to think about where they fit in it all. It is also a beautiful piece of jewelry. Sharon, what a fabulous, succinct synopsis of how I want others to approach and interact w/ this piece. I want the viewer to look inside and ponder how they naturally would; no decided “sides”. Thank you so much for stopping by and sharing your wonderful thoughts regarding my work! Thank you for sharing your incredible work, Patricia. I’m struck by how this jewelry series encapsulates a certain time and place in history (perhaps a successor to the cameo reliefs of an earlier era). What an completely interesting remark re: cameos and its influence on later-day jewelry. For me, the history of jewelry and all of the decorative arts always find a place in my work; it’s unexplainable but I do believe my fascination w/ the rich history of “pattern” is why. And yes – our amazing produce, culinary choices (and quality of life) do owe a nod towards NAFTA. Thanks so much, Gina Marie – I always look forward to your visits and articulate comments! In this fast-paced world of ours, goods and information, and art as well, flow freely (most of the time) and quickly, with a simple click. As a craftsperson, I find that it is both a challenge and a blessing. Either way, I find myself often re-evaluating what I do/why I do it. Patricia, your widget-lockets series really encapsulates this dilemma. Your choice of techniques – your repoussé is impressive, as usual – your attention for details – it all comes together, beautifully! This is art with substance. Thought-provoking. Thank you so much for that! Dominique, I read this earlier this afternoon and now it’s 3-4 hours later in the evening and I am still speechless at your incredibly generous remarks. Coming from a very talented jeweler, fine craftsperson and long-time educator such as yourself, I’m completely flattered. Also, your perceptive comments above re: how quickly information is exchanged vs. the polar opposite of what we try to accomplish as makers of fine craft is truly just as you said: a dilemma we all face as makers. It is not just “cut and dry” – we insist on a high level of skill-set when we create. I cannot possibly thank you enough for stopping by – I always welcome your visits! Everything you do is so thoughtful and intentional… I love that about your work! Then adding the excellent craftsman[woman]ship and beauty of materials… wonderful! What a surprise to see the text inside the locket. A nice juxtaposition of materials, technology, and ideas. Laura, that is so incredibly kind of you – thank you. I’m so happy you stopped by! Also – I shared your most recent blog post to my personal Facebook, because I’m so completely blown away by your talent, determination and ingenuity w/ how you created such a gorgeous living environment w/ gardens. Truly magnificent! This piece is just simply stunning. I am so impressed by your artistry and your writing. Just fabulous, Patricia. Always a treat to visit with you! Anita, I’m so incredibly flattered by your remarks, and especially coming from a painter whose own work is so exceptional! I found myself become more attached to this piece than I normally ever do – but that’s definitely not the point of making, I feel. I’m beyond thrilled you came by to visit, and I truly appreciate your lovely feedback on my new work! I always want to see your posts and somehow I’ve missed the last few in my reader. Well, I’ve definitely learned a new term today – “rip-snorter” – Philippa, you make me chuckle!! I have a friend in Vic/Melbourne that is teaching me all these great Aussie terms. I will have to add this one to the list! Thank you for your wonderfully sweet compliments re: the piece’s craftsmanship, as this means alot to me. So glad you stopped by today; and much congrats to you again on your new solo exhibit! Thanks Patricia. Just having fun. It is probably a British term and not one you hear much any more! In Biggles books? I would never have made the connection to Biggles if you didn’t mention it, but I admit getting my literary history from watching many hilarious Monty Python comedy sketches involving references to him. (The Python players were so irreverently funny!) Thanks again, Philippa! Gorgeous work Patricia….someone will be very fortunate to wear such a beautiful, thoughtful (and thoroughly modern) piece. Robyn, thanks so much. I do feel that this is one of my strongest pieces in this “Widget Locket” series and have been fortunate to hear such lovely feedback from fellow artists, curators and bloggers (like you!) Cheers from a very chilly East-coast U.S.! Instagram killed the blogging star… well, not yet.